Santorini is the remnant arc after a huge volcanic explosion usually said to have occurred in about 1450 BC (though newer geological evidence suggests 1650 BC may be a more accurate date). The explosion left a large caldera, in the middle of which a new volcano is growing. Its most lava-spewing recent eruption was in 1950, but further eruptions are expected. On the main island, the sides of the arc facing the caldera are high cliffs, topped by pretty white villages built on the ash layer from the explosion. 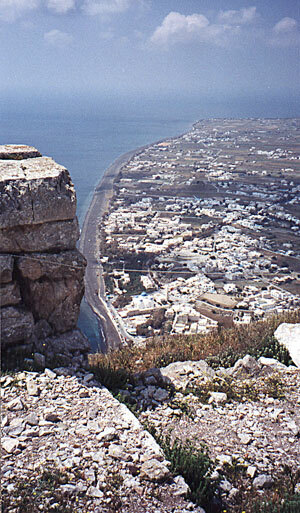 The ground generally slopes down away from the caldera toward the sea on the outside of the arc, except for a mountain to the southeast on which the monastery of Profiti Ilias was built. 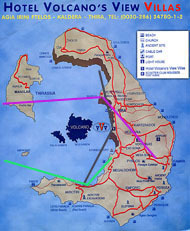 That mountain connects by a saddle to a high bluff reaching to the sea on the southeast, on which there is a Dorian site called "Ancient Thera". 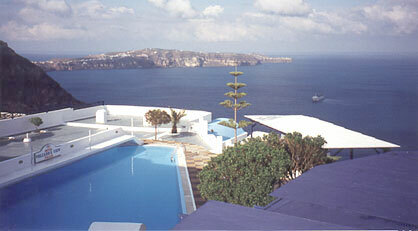 There are other high points between Fira and Oia in the north, but none that meet the sea on the outside of the arc. Click on the map to see a larger version (Map provided by the hotel in which we stayed). Click on any of the three places where two lines meet in a "V" to see a scrolling panorama of the caldera seen from that point. A view from the Reception area of our excellent hotel (Volcano View Villas) looking out over the caldera toward Akrotiri (the white village on the far cliff). Our room was below the blue roof under the strange tree in the middle. Click on the picture to see a larger version. Near the sea at the south end of the island, there is a town that was buried in the same way Pompeii was, 1829 years later. It has been given the name of a neighbouring village--Akrotiri (the village is visible in the picture above; the ancient Akrotiri is on the far side of the island). Only about 3% of the town has been excavated, but wonderful things have been found already , including graceful frescos in three-story buildings (now in the Archaelogical Museum in Fira). Unlike Pompeii, the inhabitants had plenty of warning of trouble, and no bodies have been found. 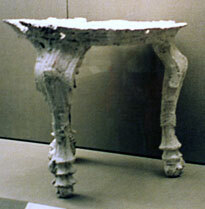 The plaster cast of the table, photographed by ambient light, attempting to hold the camera steady during a longish exposure! Flash photography was not permitted in the museum. 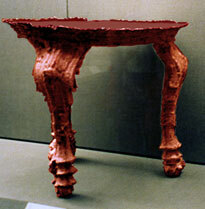 The plaster cast, recoloured in an attempt to imagine it as the wooden table it once was, making it easier to see the exquisite workmanship and design. These people were not primitive 3500 years ago! One thing the refugees left behind was a small table. In the 3650 years since it was buried, the ashfall turned into tufa rock, and the wood decayed away completely, leaving a cavity in the rock. Archeologists filled the cavity with plaster to make a cast that takes the shape of the original table as precisely as the roughness of the tufa surface allows. 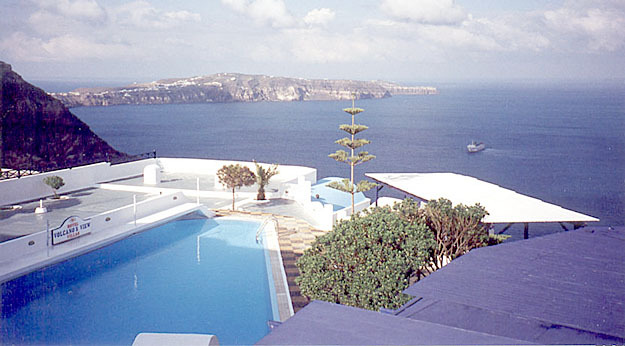 The replica is now in the Santorini Archeological Museum, in Fira, the capital. 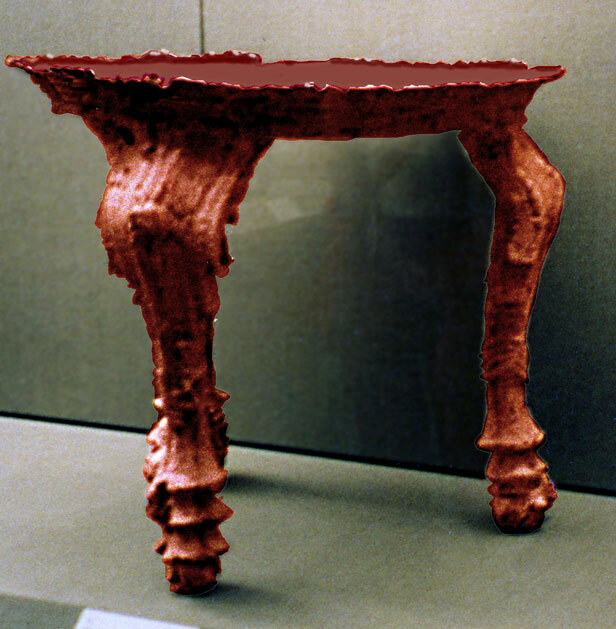 Even the relatively rough casting shows a very high degree of skill in the design and workmanship of the table, skills of which a modern furniture-maker could be proud. The Akrotiri civilisation was part of the Minoan culture. 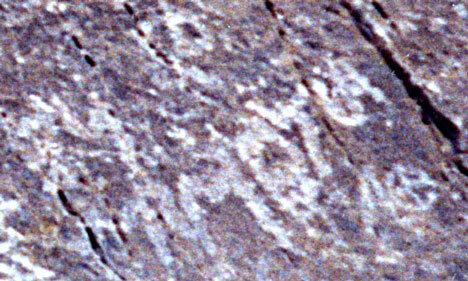 Several lines of evidence suggest that there may have been a larger city on the inner ring of land that existed before the volcano blew up, not least a picture in one of the frescos that seems to show such a place. The fit with Plato's description of Atlantis and its destruction is close enough that this inner-ring city might well have been the original of Atlantis. 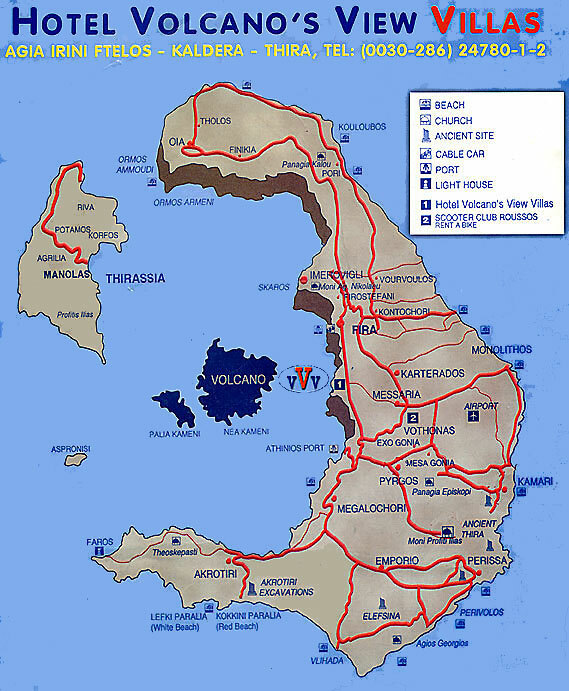 The explosion destroyed the land that was there, leaving a deep crater, and the resulting tidal wave and ashfall caused great damage to the Minoan civilsation in Crete. 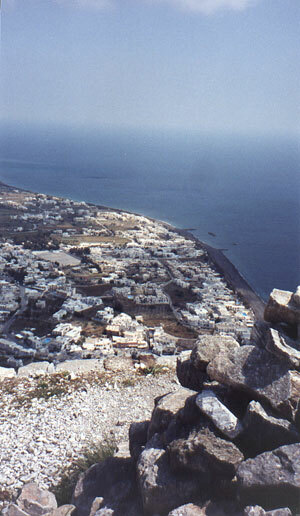 If Santorini had such a vanished central city that was Atlantis, then Akrotiri was only a suburb. But that only emphasises the wonders of the things that have been found there. Here are some notes on Thera, Atlantis, and the relationship with Egypt. One of the finds was a miniature freco or frieze along the top of the walls of one room in Akrotiri. It shows a fleet leaving one city and arriving at another. I interpret this frieze here, and suggest that the fleet is leaving Atlantis for Knossos as part of an annual festival. For the academically minded, I have also used this frieze as the basis for a discussion of evaluating interfaces for visualisation of computerized data. Modern Santorini is very pretty, and pleasant outside of the main tourist season (click for a delightful site about Santorini with many pictures). Here are three panoramic views of the caldera, one from near Akrotiri in the south, one from our hotel, and one from Imerovigli (the northern extension of Fira). (These are the same panoramas you can see by clicking on the appropriate spots of the small map above). We were in Santorini right at the start of the season. Our hotel only opened its dining room the second day we were there, and we may have been the first or second visitors of the year. That meant that the place was comfortably uncrowded, though several cruise ships arrived each day to disgorge a horde of passengers for a few hours. The popular beaches of Kamari (left, below) and Perissa (right, below) were almost empty, whereas in the high season they are packed solid with sun-worshipers. Between about five hundred and a thousand years after the explosion that buried Akrotiri and began the demise of the Minoan civilization on Crete, Santorini was occupied by the Dorians, a warlike people who built a fortress now known as Ancient Thera on a 350 m (1200 ft) high point (Mesa Vouno) overlooking the sea. 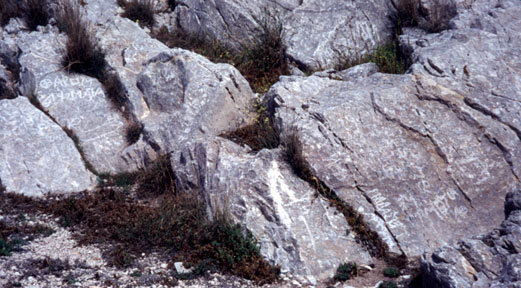 The pictures below were taken from Ancient Thera, of which some of the stones can be seen in the foreground. We tried to walk up to Ancient Thera from Perissa, but were defeated by the wind. The next day, we took a minibus ride up from Kamari to see the site. 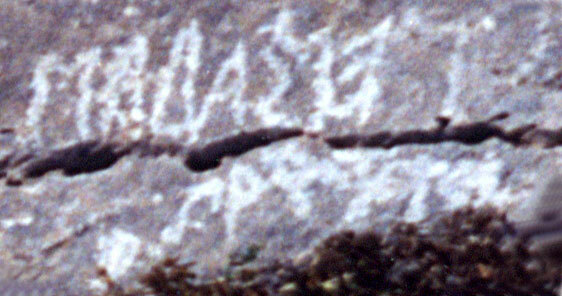 On some rocks near the extreme seaward end of the Dorian site called Ancient Thera, there are some writings like graffiti in what was called the Ancient Theran script (about 500-800 BC?). It is clearly a form of Greek. Here is a picture of some. You can see an enhanced enlargement of three of them (left-upper-middle, and two in the lower right) by clicking on the appropriate parts of the picture. The writing appears to be boustrophedon, which is to say that alternate lines are written left-to-right and then right-to-left with mirror-reversed characters.